LEGO has an immense variety in its creations. Its themes cover a lot of elements, from fantasy to real-world history. Architecture, professions and events all seem to belong to LEGO and have a version in the LEGO world. There is, however, one exception. Weapons. There is a longstanding ban on weaponry from the 20th century and beyond, as well as themes that revolve around modern wars. This means that while we have items harking back to the Vikings and the Wild West, as well as futuristic weapons such as blasters, there won’t be a legitimate LEGO sets or theme about, say, World War II, or beyond. Modern warfare is a definite ban on the LEGO company, and it seems to be staying that way for a while. However, that hasn’t stopped other companies from picking up the subject — in special, it hasn’t stopped Will Chapman. What began as a family treat for his then nine-year-old son, who wanted to recreate WWII scenarios with his LEGO, evolved into a business. Enter BrickArms. BrickArms specialises in what LEGO doesn’t: weaponry. They offer several minifigure-scaled weapons and accessories from past, present, and future, from flintlock pistols to plasma guns. All done in size and form compatible with regular LEGO minifigures. Beyond that, they also produce minifigures themselves, in military uniforms and other clothing that would befit the themes available. Surprisingly, there aren’t any issues between the two. While LEGO doesn’t actively endorse the third-party pieces, it also isn’t explicitly against them. As such, these aren’t counterfeit or “fake” LEGO minifigures: they’re produced according to the LEGO standards and violate no copyright from the Danish manufacturer. This way, people invested in both war recreations and LEGO pieces can easily bring their two pastimes together. The BrickArms catalogue is quite impressive and the end-results are also surprisingly cheap — each gun (expertly crafted and LEGO-smooth) going for about a dollar a piece. This makes it easy for war and LEGO enthusiasts to buy in bulk and man their minifigures for veritable battles. Their items also come in themed packs. That is helpful for people who may not know as much about the individual items to buy them independently. 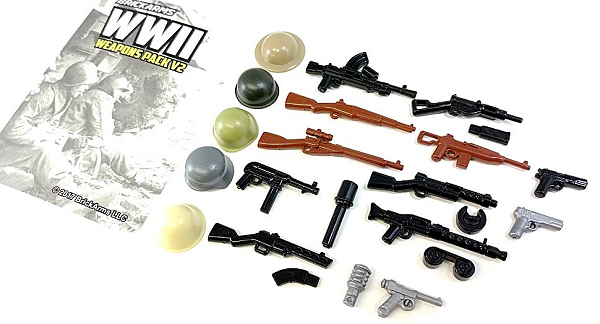 The variety is great, ranging through historical pieces and accessories, such as helmets for soldiers, German and Allied accessories and weaponry, and much more. 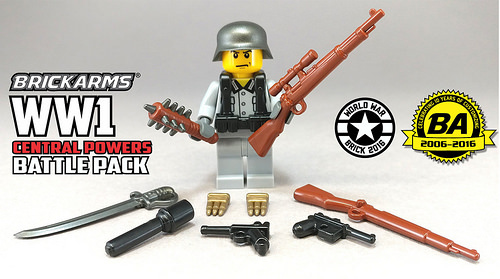 Want an authentic LEGO WWII soldier? BrickArms has got you covered. This extends to weapon crates, vests, ammo, frag grenades, and more, all as realistic as possible within the LEGO standards. What began as a father’s attempt to please his son’s interest evolved into a much larger business. The pieces are still made in Redmond, WA, rather than outsourced somewhere else. They’re also distributed in several resellers, and there are also online options. Because of the volume of sales, it no longer sells their parts directly. However, there’s no shortage of places to buy from. This includes physical stores in the US, Canada and Australia, such as BrickMania and BrickRepublic, and several online retailers, many of which will focus on weaponry and other war-related LEGO toys as well. You can find a full list of resellers on the official website, brickarms.com. 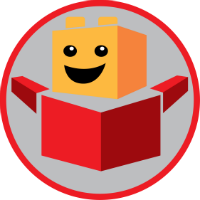 Since its launch, BrickArms has grown considerably both in scope and in reach, and it’s significant enough to be featured in the LEGO Brickumentary (2014). It also hasn’t gone immune from some controversy. Controversies or not, the truth is BrickArms is an excellent option for people wanting to create real-world war scenarios and situations in LEGO format. BrickArms specialises in what LEGO doesn't: weaponry. They offer several minifigure-scaled weapons and accessories from past, present, and future.